Nearly two years after STX Entertainment announced its Uglydolls animated movie was happening, the studio has finally found the right director. STX announced at CinemaCon today that Robert Rodriguez will be directing this animated adaptation, and the studio also revealed the first poster on the convention floor. The studio has also set a release date of May 10, 2019, which as of now is otherwise unoccupied. The film falls just a week after Marvel's Avengers 4 on May 3, 2019, and two weeks before Warner Bros.' Minecraft and Universal's Doctor Dolitte on May 24. 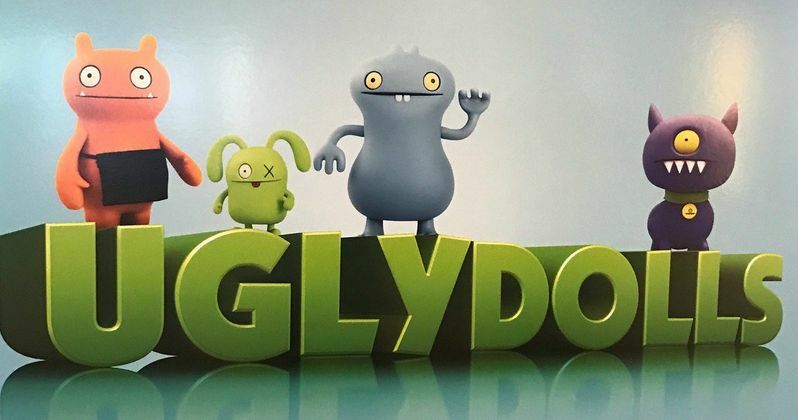 Deadline reports that STX will produce this film alongside Gigi Pritzker and OddLot Entertainment, while David Horvath, who created the Uglydoll line, will executive produce with his Pretty Ugly LLC partner Drew Matilsky. Both David Horvath and Drew Matilsky co-created the Uglydolls in 2001 with Sun-Min Kim, which started with David Horvath signed a letter to his college sweetheart Sun-Min Kim with a drawing of a monster with unique proportions. The monster would eventually become the Uglydoll known as Wage, with Sun-Min Kim sending David Horvath back a plush doll featuring Wage's likeness, which ended up becoming the basis of this successful company, and lead to David Horvath and Sun-Min Kim getting married. Populated by satirical, playful, and off-kilter characters that go by names like Wage, Babo, Ice-Bat and Wedgehead, the "uglyverse" is a world in which the traditional definition of "ugly" is turned on its head as it celebrates characters who are distinctive, special and different. This animated movie was first set up by Universal Pictures in 2013, when Illumination founder Christopher Meledandri was set to produce. That incarnation never moved forward, and just two years later, STX announced this project will serve as the foundation for their new animation division. While Robert Rodriguez is set to direct, it hasn't been revealed yet who will write the screenplay, or if this big screen adaptation will be based on a specific Uglydoll story. Along with creating these characters, David Horvath has also authored 12 Uglydoll books, including How to Draw Ugly, Guide to the Uglyverse and The Ugly Guide to Being Alive and Staying That Way, along with a series of Bossy Bear books. It's possible that this adaptation may be based on any of these books, but that hasn't been confirmed yet since no story details have been released. This news also comes just days after we reported that Robert Rodriguez will direct the Escape From New York remake for 20th Century Fox, which has a script by Luther creator Neil Cross. 20th Century Fox hasn't issued a release date for Escape From New York yet, it's possible that this Uglydolls movie may take precedence, since there is already a release date lined up, but that has yet to be confirmed. STX hasn't announced any voice cast members for Uglydolls quite yet, but with a release date and a director in place, we certainly may learn more about this project soon. Until then, take a look at the new Uglydolls poster that debuted at CinemaCon.